The sudden death of Dirk Schrade’s London 2012 Olympic team gold medal horse King Artus has cast a pall over the Wiesbaden three-day-event. King Artus died of a suspected aortic tear at the finish of the cross-country on Saturday, after finishing in second place. “We are all shocked and stunned by the tragic loss of King on this day. To lose such an extraordinary horse can not expressed in words,” Schrade said. According to reports the 17-year-old Holsteiner gelding suddenly wavered and fell down at the finish after completing a clear round and could not be saved, despite immediate assistance. FEI veterinarian Dr. Gerit Matthesen said aortic tears can happen anywhere. “The cause is still unknown. There is still no way to predict it,” Matthesen said. 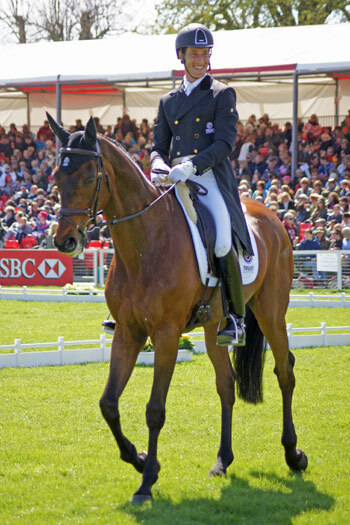 Dirk Schrade and King Arthur won including the Pau CCI4 * in 2009, was fourth at the European Championships 2011 Day-Event in 2012 and won a team Olympic gold medal at London 2012. The event was won by Ingrid Klimke, who finished on her dressage score of 36.4 penalties with FRH Escada JS. she also won the Derby-Dynamic-Cup series for young eventing horses with the nine-year-old Embassy I.
Dirk Schrade was also competing at Wiesbaden on Hop And Skip (45.6), on whom he finished fourth. Third was Japanese rider Kenki Sato and Chippieh (43.8), and in fifth was 24-year-old Julia Krajewski and London-Return. Krajewski also took out the special under-25 prize, a title she won the previous year.